100 Orleans Street, Natchez MS 39120. 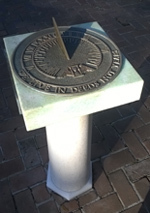 Dial is in the rose garden of Rosalie Mansion on a bluff overlooking the Mississippi River. Rosalie Mansion is owned and operated by Mississippi State Society, Daughters of the American Revolution. In 1716 the French built a fort on the bluffs of Natchez and named it Rosalie in honor of the Countess of Pontchartrain. In 1820 Peter Little, who came to Natchez from Pennsylvania in 1798 at the age of 17, purchased a portion of that land on which to build his home. He decided to keep the name Rosalie in honor of the fort and its settlers. The mansion and land was purchased in 1938 by Mississippi State Society, Daughters of the American Revolution. In the rose garden this 24 inch horizontal brass dial sitting on a modern pedestal of marble. The dial is of standard design with a chapter ring delineated in 15 minute intervals surrounded by Roman numerals from 6am to 6pm. 12-noon is marked by "O". The hour delineations themselves extends from 4am to 8pm. The gnomon is a simple triangular shape about 1/2 inch thick, but the hour lines are not adjusted for its width. The dial plate is decorated with an hourglass with wings (Time Flies) and an embossed dial inscription.